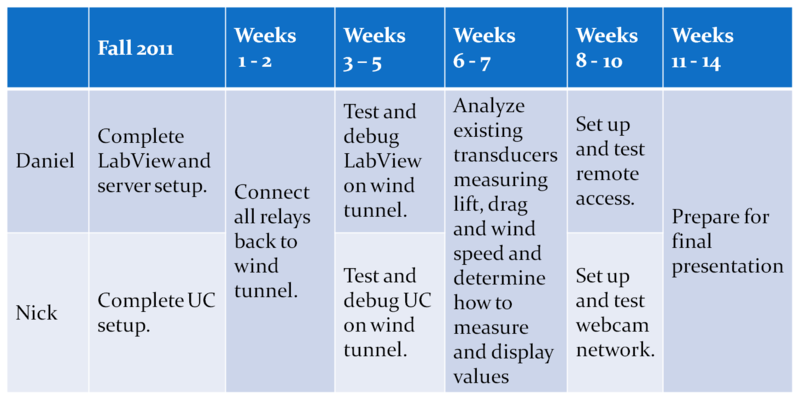 The overall objective is to create an automated controller for an existing wind tunnel located in the Mechanical Engineering department of Bradley University. This controller will allow a user to position objects inside the tunnel with linear actuators, turn on the wind tunnel and adjust wind speed. A user will be able to control the tunnel on a local PC or remotely through the internet. At this point, all damaged parts have been replaced and the wind tunnel controller has been tested and shown to be effective. The LabView interface has been updated to provide a user friendly interface and can also record data. The server PC can still only be accessed by an on campus computer so security settings will need to be updated to allow for access off campus. Our replacement parts have arrived and we now are able to turn the wind tunnel on and off, adjust the damper in both directions and control one actuator. When we have time we will replace the other two H-Bridges and then have the ability to move three actuators. Only one actuator is actually installed on the wind tunnel at this time so replacing the other H-Bridges is not a high priority. Further troubleshooting between the server and the microcontroller showed that a problem existed with either the comm port on the server or the serial cable that was being used. Using a laptop as a server and a USB to serial cable, we were able to control the wind tunnel locally and from a remote computer in a different lab on campus. At this point, we still can only turn the wind tunnel on and off and move the damper in only one direction. We will be able to control the actuator and move the damper in both directions until our replacement parts arrive. This week we finished installing the switches to control whether the damper and blower are controlled locally or remotely. Wires were routed to the location where the microcontroller and relays will be positioned. The relays were all connected and hyperterminal was used to interface with the microcontroller. Using hyperterminal, we were able to turn the wind tunnel on and off and turn the damper on. With the direction control relay damaged, we can currently only move the damper in direction. We then attempted to control wind tunnel by way of LabView. At this point, LabView is seeing all of the sensor data that is being sent from the microcontroller but the microcontroller does not appear to be receiving commands from LabView. Troubleshooting will continue next week. Some equipment has been damaged which has caused setbacks. When the double-pole double-throw switch was connected, the protection diode was installed backwards, causing damage to the diode, the DC to DC relay and all H-Bridges. A request for replacement parts has been placed. In the mean time, two of the switches between local and remote control have been connected to the system and one more is needed (this will be for damper control.) Some of the wires for the control relays have already been routed to the location where the microcontroller will be positioned. At this point, the remaining switch and wiring can be installed so that when the replacement hardware is received the control system can easily be connected. We have been given access to the lab PC that will be used as a server and work has begun set up the server as well as to connect to the webcams. The LabView user interface is mostly complete; All that remains is some debugging and configuration updates. This week we decided to use a simple three way light switch to switch between local and remote control for both the blower and damper. We also connected the lift, drag and wind speed sensors to the microcontroller and collected data to determine the characteristics of each of these sensors. All sensors are linear in nature and we used the linear regression function in Microsoft Excel to determine a voltage to measured value function for each sensor. The damper relay was connected to the wind tunnel and the microcontroller was used to turn the wind tunnel on and off. Testing on controlling LabView via the internet through the server began as well this week. This week was spent updating the interface to the microcontroller to allow for all inputs and outputs that were not originally designed to connect directly to the microcontroller. This includes the outputs to control the blower and damper. These outputs were then connected to the appropriate relays and tested. We are a little behind schedule at this point but we should be able to catch up duing the next couple of weeks. This week was spent making some final updates to the microcontroller code. The code has been updated so that the microcontroller will be able to stop an actuator after three seconds without a significant change in position. Some time was spent investigating the current power and direction switches on the wind tunnel to get an idea of how the relays for the remote relays will connect into the system. At this point, some wiring on the microcontroller will need to be updated to make use of the ports that weren't being used on last year's project. At that point the relays can be connected to the board and tested and then the system can be connected to the wind tunnel. Further work on developing the LabView interface was completed this week as well. The microcontroller code was updated to include a simple boxcar filter which takes a running average of the fifteen most recent samples before outputting the data to the serial port. The baud rate was changed from 19200 to 57600 to handle all data that will need to be transmitted and received. Communications between the microcontroller and Labview were tested and verified using the Labview PC to deliver actuator commands. The project proposal was presented today. The microcontroller code was re-written and a new Labview setup has been built. A Java program is being used to act as server and facilitate serial communication between the microcontroller and Labview. Communication between the microcontroller and the Labview PC is still not working as bugs need to be worked out of both systems. The microcontoller and one of the linear actuators were moved from the lab in Jobst 105 to the senior lab for testing and program development. Moving forward, we will focus on rewriting the microcontroller code and the code for Labview and the server. Once the Labview/server and microcontroller code are complete, the microcontroller board can be re-wired and we can begin working on attaching our relays back to the wind tunnel. The first few weeks of lab were spent studing the work of the previous two projects and the current setup of the wind tunnel. The documentation of the previous year's work is very clear as far as the microcontroller and Labview are concerned. However, no documentation exists to explain how our relays interface with the existing wind tunnel to allow for a remote override. Last year, a National Instruments A/D converter was used to take data and allow for communications between the server PC and the microcontroller. After discussing with Dr. Malinowski, we decided to remove the A/D converter and use a serial port for all communications between the server and microcontroller. Furthermore, all A/D conversions will be done by the microcontroller.